Please Note: In the above picture, top right side for size comparison, Left: 6x45mm with .243" or 6mm projectile and on Right .223"or 5.6mm projectile. 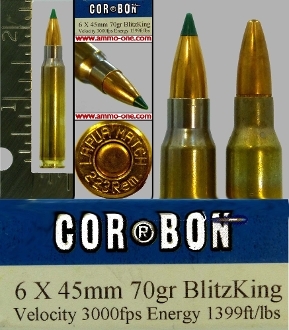 One Cartridge , not a box: 6x45mm for AR-15/M16 rifles. Produced by COR-BON, factory loaded ammunition using Lapua Match .223 cases with "LAPUA MATCH 223 Rem." Head-Stamped and loaded with a 70 grain BlitzKing PCJHP (Plastic Covered Jacketed Hollow Point) projectile. History of 6x45mm for AR-15/M16 Rifle cartridge: This cartridge was introduced by Black Hills Ammunition Company in 2010 for use in AR15 /M16 rifles . The cartridge is produced by taking a .223" caliber case and necking it out to accept the larger 6mm or .243" projectiles. It is similar to the older 6mm TCU, except it is not fire formed and may have a slightly different neck angle. The AR-15/M16 rifle can easily be converted to the 6×45mm with a simple barrel swap with few or no further modifications to the rifle.